Home Blog How many lives does a doctor save? This is part 1 in a 3 post series. See also part 2 on diminishing marginal returns and part 3 on replaceability. We now have a full career profile on medicine, which contains a more up-to-date and in-depth version of this research. Doctors have a pretty solid reputation as do-gooders. There are regular news stories about how advances in medical science promise to help more people than ever before. Many of us have had the experience of being ill, seeing our doctor, and being made better. I want to study medicine because of a desire I have to help others, and so the chance of spending a career doing something worthwhile I can’t resist. 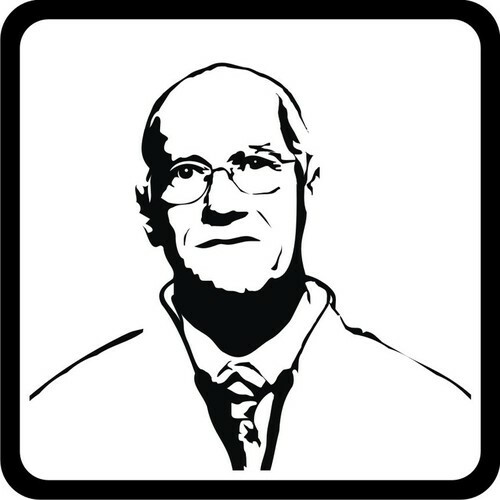 Of course, Doctors don’t have a monopoly on altruism, but I believe the attributes I have lend themselves best to medicine, as opposed to all the other work I could do instead. Was I right? Is medicine a good career choice for someone wanting to ‘make a difference’? Over the next few posts we are going to try and answer this question, and try to estimate the impact one can expect to make becoming a doctor in the UK (which will be pretty similar to the impact made anywhere else in the developed world). This post will look at the average direct impact of a doctor. To estimate this, we’ll look at the total impact of medicine and then divide it by the number of doctors. The second post will try and account for the fact that by becoming a doctor, I’ll only cause there to be additional doctors. Since the first doctor will add far more to health than the hundredth, my impact will be less than the average direct impact. The third post will account for replaceability: that if I never went to medical school, someone else would have taken my place. To wrap up, the final post will discuss how a budding doctor can make the biggest difference they can. How much good does medicine do? Life expectancy in the UK was around 47 in 1900; it is now 80. To what degree can medicine take credit for this vast improvement? Despite this, it is likely medicine has some effect: data from the Netherlands show that there are ‘bumps’ in life-expectancy of those with a given disease that coincide with the advent of improvements in that diseases treatment. We really want to know is how big that effect generally is: is medicine 40% responsible for our better health? 4%? 0.04%? But Iatrogenic (medicine-caused) disease reduces life expectancy by 0.5 to 1 year. Medicine also improves wellbeing: the average person has five more years free of disability. Bunker’s method is likely to overestimate the impact of medicine. The impact of a treatment in a clinical trial is known to be much higher than its effect in everyday clinical practice. However, it is the only quantified estimate available, so let’s use it to try and work out how much good an individual doctor does. We do not know what it would be like to ‘subtract away’ all medical care from a population, but the 1900 population is not a bad surrogate: at this time, medicine was barely funded, unavailable to many and primitive. 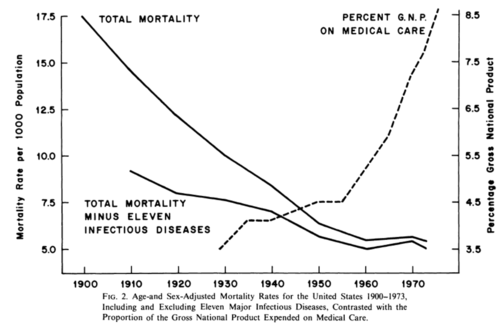 So ‘amount of good done by medicine between 1900 until now’ approximates ‘amount of good done by medicine’. We’ll assume the benefits of medicine primarily consist of benefits to our health, though of course there might be others. We’ll also assume that we’re talking about doctors practicing medicine (providing care); medical research is a potentially high impact avenue beyond the remit of the current discussion. We can use Bunker’s estimates to perform a ‘back of the envelope’ calculation of how much impact on health an average doctor has. To do this we’ll be using the Quality Adjusted Life Year (QALY) as our metric: one QALY is one year of healthy life (1). According to Bunker, the average person gains about 5.25 years due to medicine, but loses 0.75 years due to medicine-caused disease. That makes for a net gain of 4.5 QALYs. But we also need to consider how much healthy life is added by treating disability. This is trickier, but a generous estimate is to equate the ‘5 free years of disability’ to 2.5 QALYs (2). Totting those up means the total gain per person is seven QALYs. On average, each of us has seven more years of healthy life (either in length or in quality) thanks to our doctors. This doesn’t look too bad: intuitively you could think of it as saving about 90 lives. But it turns out this figure is an upper bound. We’ve used generous estimates for the amount of good done by medicine – most experts think it should be less than this. We’ve ignored the fact that the increase in life expectancy in old age is probably associated with increased disability, and so the 4.5 years of increased life expectancy should not be counted at ‘full value’. Doctors cannot take sole credit for the impact of medicine: what about nurses, scientists, cleaners, managers? More importantly, the figure we’ve worked out does not tell us how much difference I might expect to make by becoming a doctor. What we need to work out is the additional good done by an extra person becoming a doctor that wouldn’t have happened otherwise. Diminishing marginal returns  some tasks performed by doctors have more impact than others. If there were one fewer doctor, the highest impact tasks they perform would be given to someone else, so the total impact wouldn’t reduce proportionally with the number of doctors. Replaceability  if I don’t become a doctor, someone else will. So again, the difference I make is reduced. We’ll discuss these effects in future posts, but they will mean that the impact of me becoming a doctor is much less than our estimate. Yet in any case, I can do much more good by giving wisely. If I donate 10% of my salary to AMF, I’ll protect about 20,000 people from malaria, saving about 6 times as many QALYs, and causing many other economic and education benefits (3). I can do far more good with my chequebook then I can expect to accomplish with my stethoscope. Can we quantify how much good you do with your career? How good are the best? Should we sacrifice doing what we love to make a difference? Should we just do what we’re passionate about? (1) For more on QALYs and measuring healthcare, see here. (2) Bunker only talks about ‘years made free of disability’, but how valuable this is depends on how bad the disabilities are: five years free of dementia is worth much more than five years free of knee pain, for example. The WHO has a table of how much given disabilities should ‘weigh’: a weight of 0.2 means five years free of this disability is worth about as much as one extra year of healthy life. As very few conditions (and none of the commonest ones) are weighed higher than 0.5, we can be confident that the ‘five life-years made free of disability’ will equate to no more than half that amount in QALYs. So around 6 times the (upper bound on) direct benefit of a medical career.